Assassin’s Creed 3 finally made it to PC on Tuesday, but an astute reader pointed out that it hadn’t wound up on Steam yet. And it still hasn’t. As it turns out, there’s been a little trouble at Ubisoft’s end. 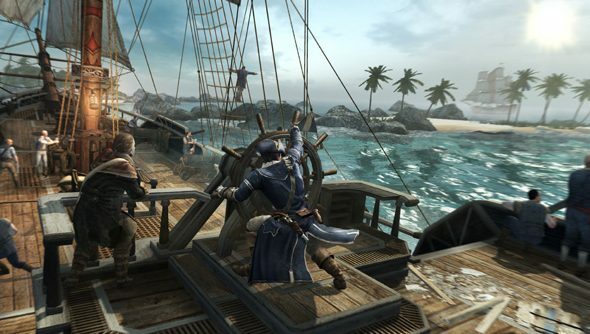 “We’ve been in discussions with Valve about Assassin’s Creed 3 and Far Cry 3, but for the time being the games are not available via Steam in the UK,” Ubisoft told PCGamesN in a statement. The situation appears to be a repeat of the issue we talked to Valve about back in July, which has seen a number of Steamworks games over the last three years withheld from sale on Steam but made available in retail stores in the UK. At the time, Valve’s director of business development Jason Holtman believed the problem resolved. But he explained that “at the end of the day, the partner can choose what to do”.